The International Committee of Architecture and Museum Techniques (ICAMT) has recently launched her new website. 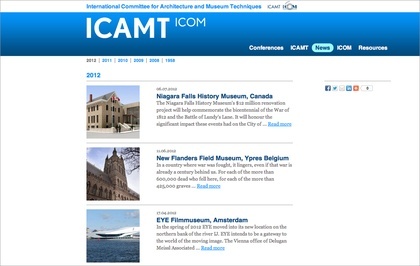 ICAMT is one of the 26 International Committees of the International Council of Museums (ICOM). ICAMT is a committee specializing in architecture of museums and everything that exhibition planning involves. As ICAMT is part of The International Council of Museums (ICOM), the work crosses borders and cultures easily. The site is set up to be multi-lingual to help ICAMT translate their ideas to museum professionals everywhere. The website is intuitive, informative, and you can share any post on your favourite social media platform with a single click. The ICAMT website has been developed by Visualspace. You can find it here.